Our theme was a Cajun-inspired pot of red beans and rice, last week we turned that theme into a Tex-Mex number with chorizo and peppers. Our final variation on the theme abandons flashy spices but still provides a show-stopping performance through a touch of elegance and subtlety. 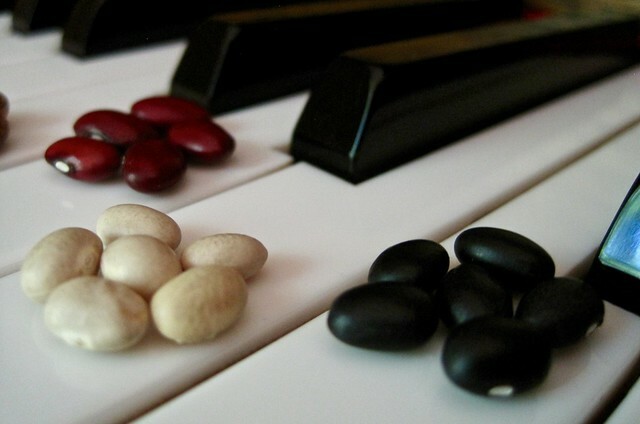 Once again, we’ll swap out the beans; this time replacing them with navy beans. Instead of cured or heavily-seasoned meat, we’ll impart deep flavors by adding dark meat chicken and an all-star cast of herbs and spices. We’ll transform the recipe into a hearty dinner reminiscent of cassoulet (but with a lot less time and effort!). KEY INGREDIENT: Lemon Juice — Though it’s one of the handiest kitchen appliances ever invented, filling your home with amazing aromas, a slow cooker can sometimes turn even the most flavorful ingredients a tad bland and flat. To sharpen those flavors a bit, add a hit of lemon juice for a spark to reawaken the herbal flavors; you’ll probably find you’ll need less salt too. Even if you aren’t a fan of eating the skin, browning dark meat chicken and allowing the skin to cook along inside the slow cooker infuses everything in the pot with a deep chicken flavor. This is a very easy but elegant dinner. Heat the oil in a large skillet over medium-high heat until shimmering. Meanwhile, sprinkle the chicken pieces on all sides with the salt, pepper, and thyme. Add the seasoned chicken pieces to the skillet skin side down; cook 3-5 minutes or until just browned. Turn and cook an additional 2 minutes or until lightly browned on the underside. Meanwhile, in the slow cooker, combine the next 10 ingredients (onion through chicken broth). Place the browned chicken thighs atop the bean mixture, nestling them into the broth but not submerging them. Cover and cook on high for 5 hours or until beans are sufficiently tender. If you’d like to crisp the skin on the braised chicken before serving, remove the chicken pieces to a broiler pan and place them beneath the broiler for about 2 minutes; otherwise just remove to a plate and keep warm. Meanwhile, using a slotted spoon, remove 1 cup of cooked bean mixture to a medium mixing bowl; mash with a fork to form a paste. Stir the mashed beans back into the slow cooker to thicken the beans. Stir in the lemon juice; add salt and pepper to taste. If serving with rice, divide the cooked rice evenly onto four plates. 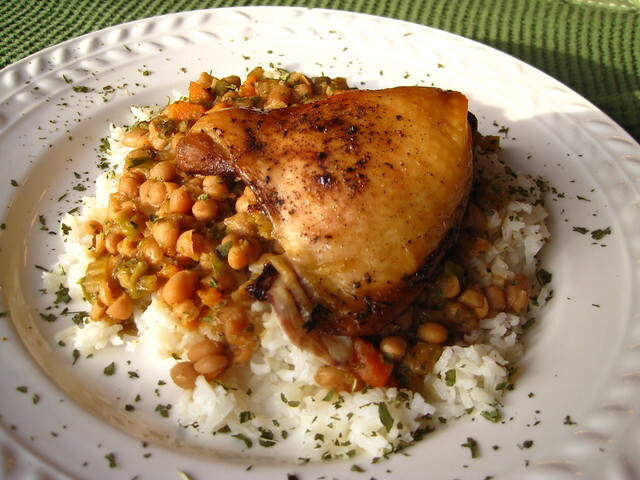 Top with the beans, and serve the chicken atop the beans. Served without rice, this goes excellently with toasted baguette pieces or a side salad.